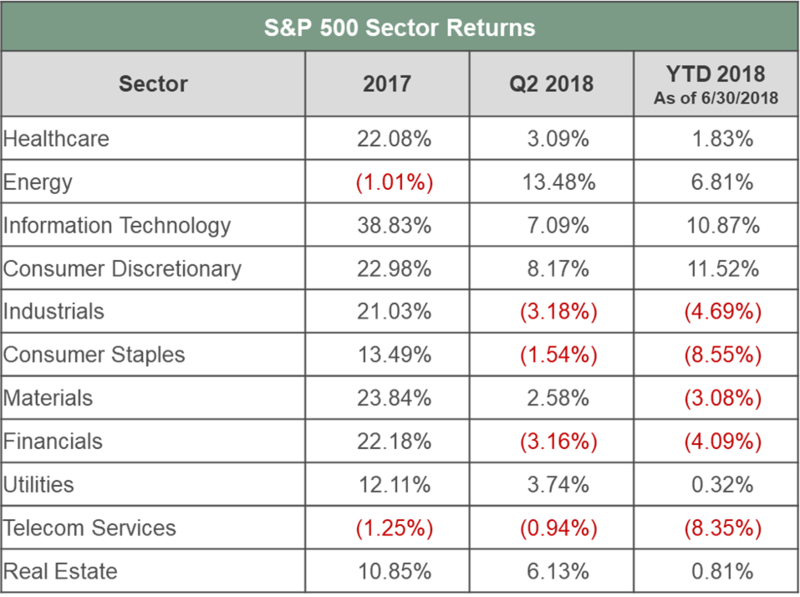 Back to the markets…the domestic economy and stocks showed their resiliency in the second quarter, with GDP expanding over 4% and the S&P500 returning over 3%. Equities are up over 5% from the February lows. Market skittishness has also eased to a more relaxed summer level with the VIX trading in the low- to mid-teens despite continued trade war tensions and concerns of an over-heated and over-extended business cycle. Corporate earnings and business fundamentals show further strength, and investors are basking in the moment. We remain generally sanguine on the economy, which should be supportive for stocks, however we take opportunities like this to narrow our areas of focus rather than leaning into the rally. The domestic economy is doing well, with unemployment low and wages increasing. Policy makers are successfully threading the needle of maintaining growth, while containing inflation, while hiking rates, and while shrinking the Fed’s balance sheet. The Leading Economic Indicator index is off its recent peak but still healthily growing at over 5% through this country’s second-longest expansionary cycle. We had commented in prior letters that tax reform and de-regulation would further boost the economy, however our focus was around the sustainability of their effects. 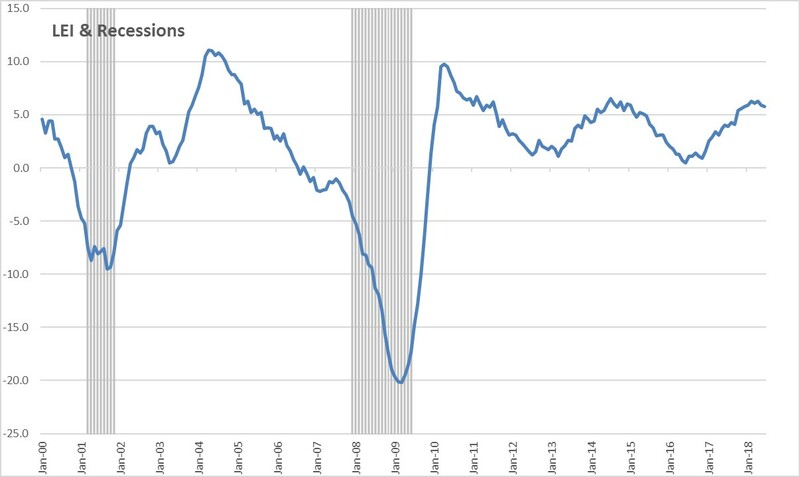 So far, we are seeing signs of follow-through as hiring and investment in businesses (via capital expenditures) are both accelerating, all the while expanding margins. Access to capital remains wide open, further greasing the gears for growth. First quarter earnings were strong and indications for the second quarter (so far) appear to be similar at over 20% year-over-year growth. However, as multiple expansion is much more difficult to achieve, earnings (e.g. fundamentals) remain tantamount. Companies missing expectations or softening outlooks are being taken to the proverbial woodshed. We think stock selection, via active management, is key at this part of the cycle. Inflation remains our biggest focus. Accelerating growth, rising wages, and a slow-moving Fed all contribute to this risk. Trade wars and increased tariffs on imports will also exacerbate it. We hear from our managers and clients alike that there are more jobs than interested workers. One such example is long-haul truck drivers where signing bonuses and near six-figure salaries aren’t enticing enough to fill the demand. The impact of tariffs is creeping into earnings, as the cost of materials is increasing while prices haven’t moved up commensurately. Companies subject to higher import costs are seeing pressure on margins as well as stock prices. Ultimately, wages will continue to rise as will the cost of goods, and while Chairman Powell plans to continue to hike rates (much to the chagrin of the President), the pace will likely follow rather than be ahead of inflation. Steel prices are up 40% YTD. Given the cyclicality of oil, we touch on the Energy sector separately. Looking into July, we know oil is off its peak, but a late June OPEC meeting without any supply surprises saw WTI rally over 13%, breaking $74 a barrel at quarter-end. The commodity has found support and in this trading range is profitable for producers to invest in their wells. Backed by more rational capital structures, the sector is benefitting from strong fundamentals and earnings growth. The macro twist, however, is that higher oil prices also puts inflationary pressures on the economy. “Frenemies” is probably a little generous when describing the current status of our relationships with foreign leaders and trading partners. Despite the US sharing the privilege to host the World Cup in 2026 with Mexico and Canada, NAFTA negotiations haven’t gone as smoothly. Furthermore, trade tensions with Europe and China continue to escalate, heightening inflation concerns. While we can debate the tactics and successes of the administration in equalizing trade agreements and contribution to joint security efforts, the risk is that we are diminishing our long-term reliability as a trading partner while China’s increases. In addition to trade tensions, political uncertainty further weighed on developed and emerging markets. Without going into detail, we’ll remind readers of the ongoing Brexit drama, the failed then rejuvenated coalition party in Italy, Latin American elections, and ongoing concerns with Russian relations in addition to their own economic challenges. Turkey, Venezuela, and Argentina are also dealing with internal economic issues that have weighed on equity and fixed income markets. We remain constructive on equities, supported by a backdrop of slow and steady economic growth and solid corporate earnings. We are likely in the latter stages of the business cycle, but this could persist for another year, if not longer. The relative value in stocks is more attractive than in bonds as we expect the Fed to gradually continue to hike interest rates. There has been heavy focus on the relationship between the 2- and 10-year treasury rates and how a negative spread may be a precursor to a recession. We appreciate the predictive pattern, but rather than solely looking at a single indicator, we digest it in context of the broader markets and economy. 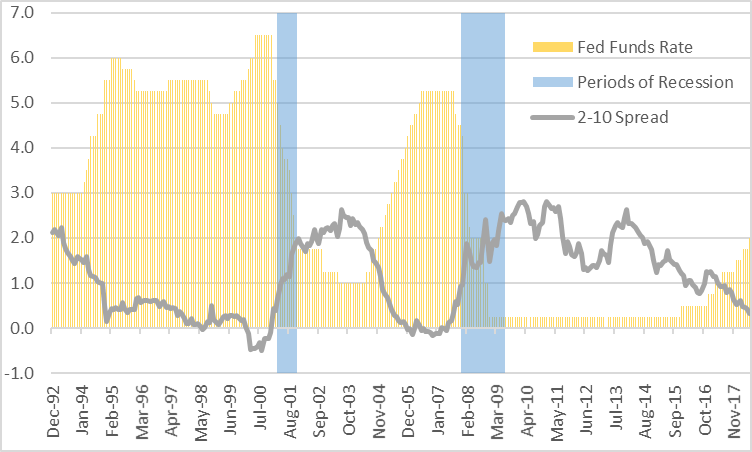 We think there is a lot of technical demand in the longer end that artificially keeps rates low. Additionally, new issuance will likely relieve some of this tightness. Finally, we do not expect an inversion in isolation, rather an effect of other, new exogenous factors which we will take into consideration. As we noted earlier, US equity markets have performed well in the quarter. 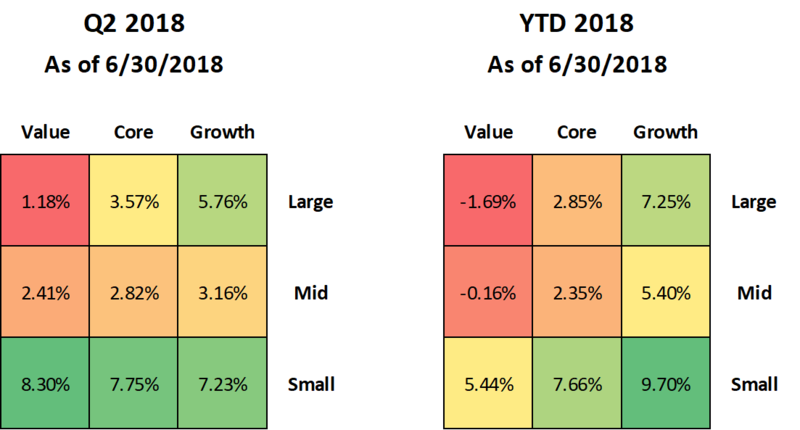 We would highlight that small-caps, which are viewed to be better insulated from a trade war, have meaningfully outperformed in the quarter and so far this year. That makes a lot of sense to us and supports our recommendation to lean more towards small- and mid-cap companies. What’s more interesting to us is continued the divergence in performance between Value and Growth stocks, especially when the market is trading at above-average multiples. 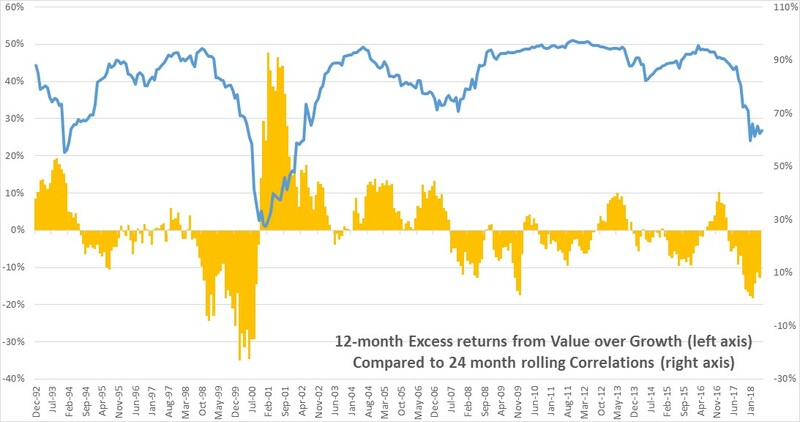 Below, we looked at excess returns from the Russell 1000 Value index versus Russell 1000 Growth on a rolling 12 month basis. Value has been lagging growth by over 10% since the fourth quarter of last year. What’s interesting is that correlations between the 2 styles tends to typically run high at around 80-90%. However, as of the end of the quarter, the correlation had fallen to under 65%. This is really low, apart from right before the tech bubble starting in 2000. We do not think correlations can stay this low for long, and should the relationship normalize, Value should recover meaningfully versus Growth. Thus, we are biased towards value-driven companies and sectors such as Consumer Staples, Energy, and Financials. Healthcare is a solid value-based defensive sector as well. We have become more constructive on international developed and emerging market equities as they have become more attractive with the recent sell-off, but are cognizant of their heightened volatility on concerns over a trade war with China. Inflation risk and further escalation of trade wars would be a concern. The US Dollar has steadily rallied, but the persistency of the trend today is more balanced. Economic growth and rising rates indicate strengthening should continue, but there is less asymmetry to this trade. Thus, emerging market equities look pretty cheap, however we think opportunities are not broad-based and require more active stock selection. We are underwhelmed by the opportunity in fixed income. While it is impressive that money markets now yield around 2%, this is barely keeping up with real rates and thus should not be viewed as an “investment”. Total return opportunities in traditional fixed income are limited as rates continue to rise and central bank tightening weighs on bond markets. We have shifted significant fixed income exposure toward floating rate and idiosyncratic credit and believe that active managers will be best positioned to capitalize on uncovering pockets of value across the yield curve. Even in floating rate credit, we are very selective as you may be jumping out of the interest rate “pan” and into the credit “fire”. Spreads are tight and we may be at a point where investors should be trading up in credit quality as high yield risk may not be worth the return. Preferreds are a smaller segment of the credit market where investors can allocate to investment grade companies, while picking up incremental yield for participating lower in the capital structure. Once again, we would invest via an active manager that can control duration rather than an ETF in this strategy. The one area of high yield where we remain constructive is in CLOs where investors can benefit from low duration while also picking up yield, albeit at the cost of some liquidity. We think you are supported by overall stable market fundamentals in the space. This is not easy exposure to get outside of hedge funds with better-aligned liquidity terms. Otherwise, we would obtain some of this exposure through multi-strategy fixed income managers. We remain selective in allocations to hedge funds and primarily view an allocation to the asset class as the “risk managed” component of multi-asset portfolios where clients can gain hedged exposure and generate short alpha during an increasingly volatile period in capital markets. Hedge funds are an alternative to fixed income exposure currently as they can offer better returns with lower correlation to rising rates and are an important component in reducing overall portfolio level risk for investors. We do have high quality preferred and structured credit managers in this strategy that can deliver solid returns in the current environment. We continue to expand our roster of illiquid opportunities across traditional private equity, venture capital, middle market lending, real estate and distressed. We believe illiquids are less affected by turbulence that exists within public markets and will be able to generate significant alpha over time. We expect the illiquidity premium to generate 300-500bps of alpha per year over public market equivalents for investors with a longer-term investment orientation.